KIEV, Ukraine -- On Monday, the EU and Ukraine are supposed to finalize a new agreement bringing Kyiv closer to the European Union. Both Ukraine and Brussels say they want to move closer. Yet strains over the treatment of opposition leader Yulia Tymoshenko make progress unlikely. Monday's EU-Ukraine summit looks set to be derailed by the EU's dismay at the treatment of opposition leader Yulia Tymoshenko. The former prime minister was convicted of abuse of power in a trial that was condemned internationally as politically motivated. The trial removed President Viktor Yanukovych's main rival off the political stage. Monday's summit marks the culmination of four years of negotiations and Yanukovych insists he expects the talks to be a success. "We are geared up for the signing of the agreement for an association with the European Union that recognizes Ukraine's right to become a full-fledged member of the European community," he said on Friday. Yet it would be something close to a miracle if the summit did indeed make any significant progress towards an association agreement, intended as a broad framework encompassing a free trade deal with the EU. Ukraine has been working to move closer to EU membership for the past ten years, and the so-called association agreement would be a major step in that direction. Ricardo Giucci, consultant to the Ukrainian government, thinks the deal would be good for both sides. "Ukraine would adopt modern standards," Guicci told Deutsche Welle. Customs would be lowered so that trade would be easier, creating better conditions for investors in the country. According to Giucci, Ukraine would also stand to profit politically from the agreement. 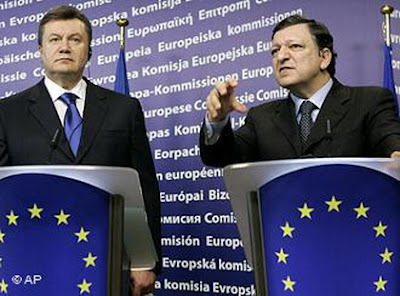 EU membership would be within reach for the first time, the explicit goal of President Yanukovych. But both Brussels and the Ukrainian opposition have their doubts about progress. "One of the crucial points on the agenda is the issue of former Prime Minister Tymoshenko," Yanukovych said just a few days ahead of the summit. The issue has significantly soured relations between Kiev and Brussels. Since August, the charismatic opposition politician is in prison, in October she got sentenced to seven years in prison for alleged abuse of power when signing a gas deal with Russia during her term as prime minster. She denies the charges and accuses Yanukovych of trying to silence her as the leader of the opposition. In the last election, she was only narrowly beaten by Yanukovych and is widely considered his main political rival. The European Union has criticized the trial against Tymoshenko as politically motivated. Both Brussels and Berlin have suggested the trial called into question the rule of law in the country. The European Union was careful not to put too much pressure on Ukraine. At a summit in Warsaw in September, EU politicians praised the improving relations with Ukraine but at the same time also pointed out that the Tymoshenko trial would not be without consequences. Only days after the verdict was out in early October, the EU commission followed up on that threat and cancelled talks with the Ukrainian president, described as a "diplomatic slap in the face" by western media. Brussels seemed irritated by Yanukovych. While he said he didn't interfere with the rule of law, he also hinted that he could work towards Tymoshenko getting off the hook. So far, the opposition leader remains in prison and is now even facing fresh charges of tax evasion. Susan Steward of the German Institute for International and Security affairs said it was "a mistake," to have linked the associating agreement to the Tymoshenko trial. "The EU has gotten itself into a dead-end street," she told Deutsche Welle. "Either Brussels drops their demands which would undermine its own credibility or the EU insists on Tymoshenko's release and then the agreement simply won't come into effect." This would mean a further turn for the worse in relations between Brussels and Kiev. Steward argued for rather aiming for small separate steps rather trying to get the entire agreement in one go. That way, progress would still be possible as "it is right that EU focuses on democracy and the rule of law. The current developments in Ukraine war very worrying," Steward warned. Meanwhile opposition politicians and NGOs in Kiev are afraid that Ukraine might turn from the EU and move closer towards Russia. Moscow is currently working on a free trade agreement with Belarus and Kazakhstan and would like to include Ukraine in that alliance. In a recent newspaper interview, Ukrainian Deputy Prime Minister Serhiy Tihipko, put it bluntly: "Should we get a definite 'No' from the European Union, then there's a good chance that Ukraine will join the free trade agreement with Russia."